The farm will be in a purple haze! Come enjoy items from amazing local artisans and vendors, tours of the farm, lavender essential oil distillation demos, lavender crafts, walk the lavender labyrinth, discover our 1/3 scale replica of the Great Serpent Mound, tour our aquaculture facilities including our fresh water lobsters! It will be a fun day! Come discover what Schooner Farms & Inspired By Nature is about! We didn't know what to expect at our very first event in 2018 - but holeeeee smokes! We had between 850-1000 people show up.It was the hottest day of the year yet Lavender Lovers from all over came to the farm. 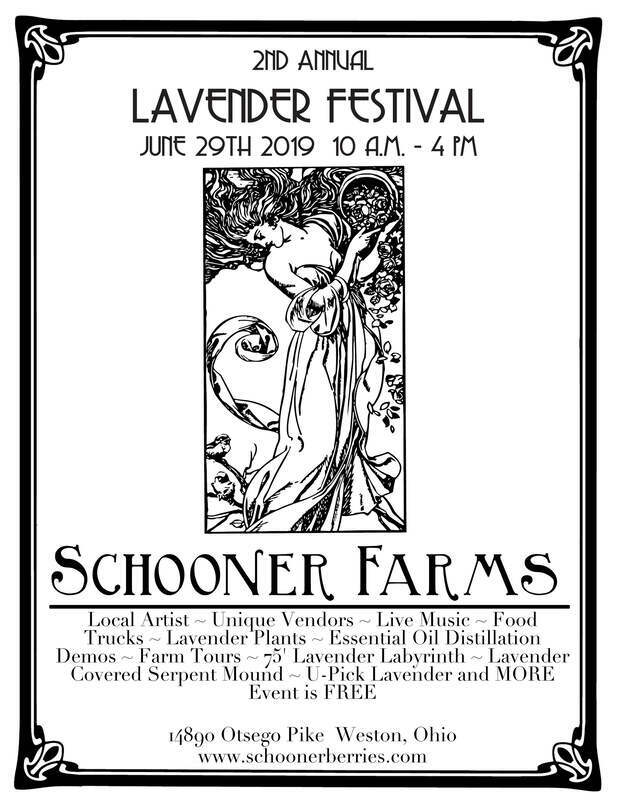 We are expanding our vendors, food trucks, live music, we will have have several varieties of lavender plants for sale, our gift shoppe will be brimming over with lavender items and it's just gonna be a fabulous day! The event is free and open to the public. PLEASE PROVIDE YOUR CONTACT INFO, WHAT TYPE OF ITEMS YOU SELL. SPACE IS LIMITED. COST IS $20 FOR A 10' BY 10' SPACE. YOU ARE RESPONSIBLE FOR CHAIRS, TENT, TABLES. WE WILL SEND YOU AN APPLICATION FORM.